Exclusive: MI6 caught up with Young James Bond author Charlie Higson to talk about his third Young Bond novel "Double Or Die". Speaking for the first time to a 007 website about the new book, Charlie Higson talks about his research for Young Bond 3 and the various homages to the Bond canon in part two of this serialized MI6 interview. There seems to be less gore in “Double Or Die” compared to the previous two, was this a deliberate toning down? I wouldn’t say there is much of an absence of gore, one guy gets reduced to nothing, and he gets cut in half at one point and loses his fingers. So yes there is a bit of gore, but it’s not in the nature of the story, as there are no big battles unlike "Blood Fever". There was no feeling of wanting to tone anything down. When Gordious visits Eton to speak to the boys, what was your inspiration for that character? The character of Charnage….Well I really wanted to write about that kind of upper class, wasteful, falling apart, drink and drug taking character. There were a lot of them around in the 30’s. I tend not to base the characters on real people. 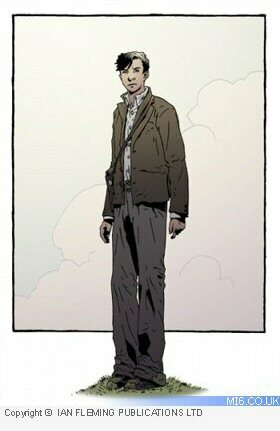 More on ideas of characters I would like to write about. In “Double Or Die” Bond walks around a cemetery and see ‘ghouls’ and ‘spectres’, and we also have a school boy with the second name ‘Oddcom’… are these cheeky hints to the later books? Towards the end of book three we see a pneumatic railway being used, obviously this has similarities to some passages of Fleming’s adventures – was it a deliberate attempt to foreshadow? Fleming obviously loved railways, writing about them and scenes set on them, like in "39 Steps" and "A Lady Vanishes" and films like that. Even he admitted it was out of date on a couple of occasions for Bond to be taking a train. There is no reason in "From Russia With Love" why Bond should be taking the Orient Express back from Istanbul, when he was carry the top secret Lektor, it would have been much easier for him to just get on a plane. He just wanted to write a nice sequence on the Orient Express, so yes, in "SilverFin" I made sure that there was a long sequence on a train as homage to Fleming and more in keeping with the early 30’s. The underground railway in “Double Or Die” turned up when I was doing a lot of research and reading about the hidden corners of London. I found out about this pneumatic railway that they had built under London to carry mail around which was never really used, so there were all these disused tunnels. I just thought that secret underground railways fitted in with the story - and children love reading about that stuff. There is a nod towards the Japanese underground system in "You Only Live Twice" when Bond has to travel on a special tunnel to reach the Japanese Secret Service. So, yes, there are echoes of Fleming in there. But it was mainly when I was researching about it, I thought it would be great in the book. 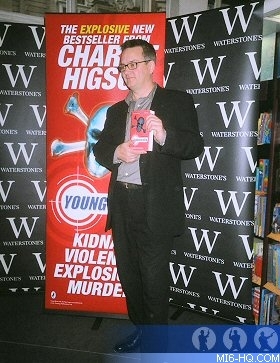 Above: Charlie Higson unveils the title at the book launch event. 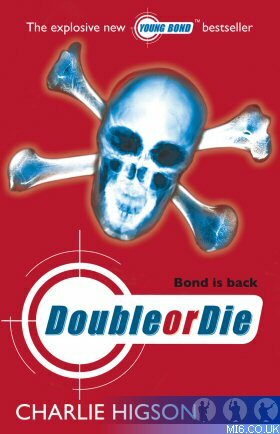 Speaking of the research, what was it like for you on “Double Or Die” compared to the previous two books? I like writing about London, all four of my adult thrillers were set in London. I live in London and love writing and reading about London so I knew a lot of stuff. But I read a lot about the Dockland’s in the 1930’s and that was probably the biggest part of the research - and going to Highgate cemetery was a lot of fun. With this book I didn’t have to go away and do a lot of complicated foreign research, I could write about want I knew. In all of them there is a level of research because you are talking about the 1930’s where things were obviously different. I had a great day out down at the Royal College of Surgeons. A guy showed me around the museum and told me some of the history and sent me a lot of stuff. I enjoyed working on that kind of stuff. Did you feel a little queasy? It’s a fairly gruesome place! The guy there said that while they encourage visitors they don’t overly publicise it. Some of the stuff they have there is quite extreme and they don’t want to encourage hundreds of kids to turn up and run screaming from the place. It’s a fascinating place and well worth a visit if you can stomach it! What are you most proud of about “Double Or Die”? I was quite pleased in the end that I was able to get all the clues working. It was the hardest thing getting them to work. They had to be things that could not necessarily be solved straight off the bat, but once they were solved they could understand the process, but be a code complex enough that no one else had seen through. The hardest work on the book was getting this right and I worked through loads and loads different clues and different levels of clues and levels of difficulty and tying them together. I’m proudest of eventually getting it all to workout and kids did find it intriguing rather than confusing. Were there any issues with translating the cryptic puzzles and clues in the plot to foreign language editions? Were any changes needed? Once I’d finished it I realised that I’d written a completely untranslatable book, because all the clues are based on word games. It’s a challenge to the different translators to come up with clues that work for the different territories. Translators like a bit of stuff like that it gives them input into the book. I was expecting a lot of them to say “I can’t do this”, but a lot of them said “this is great and I’m really looking forward to and how I’m going to get the clues to work”! Will there be any changes for the US edition of the third novel? There are always some minor changes such as minor vocabulary, which are going to be incomprehensible. What was interesting from the first book “SilverFin” to the second book “Blood Fever” was they realised they had probably changed too much and been over cautious. By toning down a lot of the violence in “SilverFin” the feedback we were getting was we want Bond to be quite meaty. By the second book “Blood Fever” there were very few changes and they were mostly changing the odd word here and there. I would hope we wouldn’t change too much for “Double Or Die”.